Debbie Juergenson, winemaker at Red Rock Winery in California, knows how to lure women to drink her red wines. 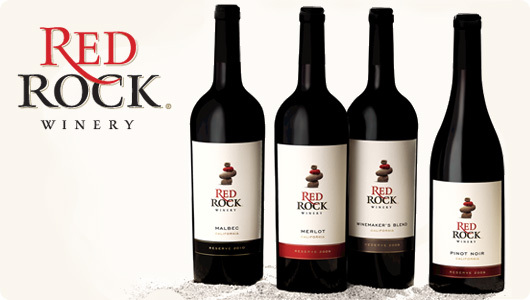 Just take a look at the website: www.RedRockWinery.com and you’ll see a picture of a woman in a bathtub sipping red wine from a glass. I’m in. So, with four bottles in tow, over the next few weeks, I sipped — and shared. Beginning with 2011 vintages, I first opened the Red Rock California Merlot, with grapes mainly from Paso Robles. Some petite sirah is blended in, which adds to the wine’s structure, supporting the fruity balance. It paired well with a traditional meal of garlic roasted chicken with broccoli, celery root and mashed potatoes. Merlot is known to work with chocolate, so a dessert of dark chocolate cake worked quite well. The next evening, a chicken parmesan sandwich worked with a glass of this merlot quite well. It’s all good. And priced at $13.99, as our all the bottles I’ll be writing about. Next, the Red Rock 2011 Winemaker’s Blend is a concoction of petite sirah, syrah and zinfandel grapes from vineyards in Lodi, Sonoma and the Central Coast of California. The syrah gives this wine a lot of spicy goodness, and the blend of these grapes is perfection. I love blends when they’re done well, and this wine fits the bill. First, I put a chicken pot pie in the oven with a whole potato to bake. Comfort food, right? Well, Red Rock 2012 Pinot Noir gave me comfort in a taste that brings me home. The jammy red raspberry flavors get me every time, and the slightest vanilla and caramel from the oak barrels takes the cake. For the next night’s dinner, I enjoyed this wine with butternut squash and braised chestnut ravioli. Works for me. Last, but definitely not least is Red Rock 2012 Mendoza Malbec, which I had served with roasted turkey and the stuff of Thanksgiving sides. I love the richness of the Argentine signature grape, and this wine did not disappoint. Made with 100 percent Malbec grape, even the zondas of Mendoza (that would be wind) didn’t stop this grape’s worthiness. It may have stopped the volume, however, so you may want to grab this bottle when you see one, or two. Are you ready for that bath now? I know I am. Enjoy! I will be sure to bookmark your blog and may come back lafer in life. I want too encourage continue your great posts, have a nice evening!